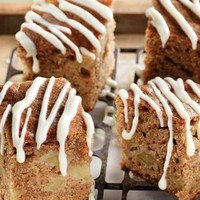 Apple coffee cake with a touch of cinnamon and a nice cream cheese glaze. I don't really enjoy heavy cinnamon vapes but this is a nice mix with just a bit of cinnamon. Perfect recipe to get you in the mood for fall. I am amazed how good the double apple comes through. Everytime i have tried to work with it it completely gets over taken by the other ingredients in my recipes. Love this recipe. Nice and simple. The apple isn't enough for me so I upped it a percent and it's perfect. The pound cake and cds are perfect together in this. What a delightful looking simple recipe. I haven't mixed this yet, but I'm having trouble getting my ATF reviews to work, and this seemed like as good a place to test it as any.